As the San Francisco Fall Art and Antiques Show draws ever closer, we’re pleased to have had one of our exhibition artworks – George Stubbs’ 1781 piece, Portrait of a Gentleman upon a Grey Hunter – singled out by none other than the show’s co-founder, Toby Rose. Having dedicated 25 years to turning the fair into one of the biggest and finest on the west coast, Toby is a huge fan of Stubbs work, and we’re delighted that she’s so excited to have this piece feature at her show. Born in 1724, George Stubbs was known in his own time as ‘Mr Stubbs the horse painter’, a rather derogatory moniker that reflected the contemporary opinion that equine portraiture was more of a craft than a fine art. Stubbs’ dedication to his subject though, went far beyond mere craft; he was famously a man of science as well as art and it was a fascination with dissection and anatomy that allowed him to capture his favourite subject with such precision. However, it is his unique ability to depict horses not only in their most anatomically correct form, but to also imbue his paintings with living, breathing vitality, that has led to him now being regarded as one of the finest painters of the eighteenth century. 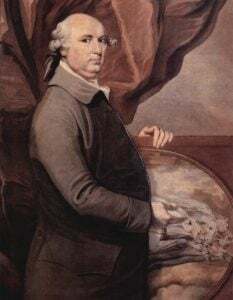 Stubbs’ eighteenth-century nickname also belies the fact that he worked as a portraitist long before he began painting horses. Portrait of a Gentleman on a Grey Hunter, then, is the perfect celebration of all his talents in one artwork, a depiction of both man and beast captured in all their glory. And not just any man, either. 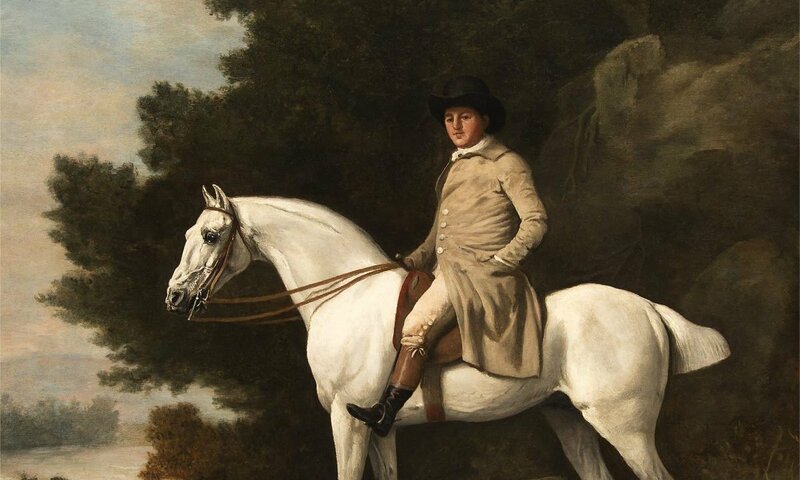 Portrait of a Gentleman on a Grey Hunter is considered by many Stubbs scholars to be one of the most personal portraits he ever painted, noting that the rider’s uncanny resemble to the artist suggests that this is likely a portrait of his son, George Townly Stubbs. As no other portraits of the artist’s son exist, this cannot be confirmed, but scholars point out that the relaxed and intimate pose of the subject do seem to mark this out as a painting of someone very close to the artist. Painted using oil on panel, an incredibly well-preserving technique thought to be an attempt to replicate the effects of the Old Masters, Portrait of a Gentleman on a Grey Hunter is also significant for its backdrop and the close resemblance it bears to Creswell Crags – one of Stubbs’ favourite landscapes. While the background of Portrait of a Gentleman on a Grey Hunter is thought to depict more of an imagined approximation of the Crags, this landscape – alongside the accurate and animated depiction of horse and man – marks this painting out as a perfect example of a classic Stubbs. It was this special quality that led this painting to once feature in the esteemed collection of Paul Mellon, described by the Yale Center for British Art as ‘one of the greatest art collectors and philanthropists of the twentieth century’ and whose passion for Stubbs arguably elevated the artist to his current status. It’s a passion shared by Toby Rose herself, a self-proclaimed Stubbs fan who describes featuring one of his works at the fair as ‘a privilege’. The San Francisco Fall Art and Antiques Show takes place at the Fort Mason Centre from the 26th to the 29th of October and Trinity House will be exhibiting this rare Stubbs piece alongside other works from artists such as Monet, Degas, and a special painting by John Steven Dews commissioned by us exclusively for the fair.